Set against the backdrop of the majestic Aravalli Mountains the Taj Lake Palace spreads across a four-acre private island on Pichola Lake, only a short drive from the heart of the city, Udaipur. 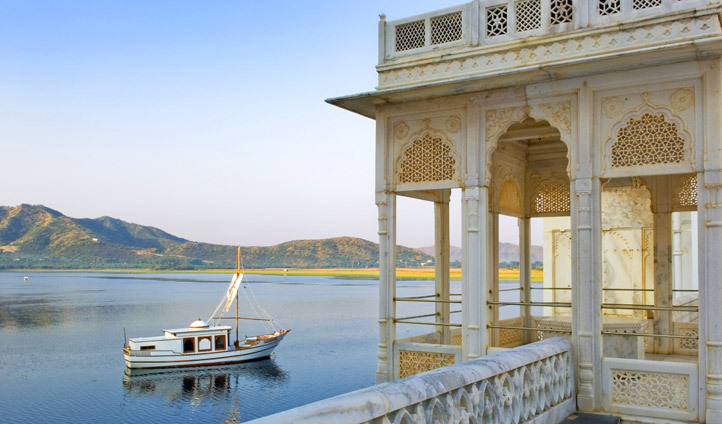 From Udaipur airport, the palace is a 40-minutes drive followed by a 5-minute boat ride from the shores of Lake Pichola. It doesn’t get more peaceful than this. One of the most romantic retreats in the world – The Taj Lake Palace offers 83 rooms and suites. Rooms feature luxurious silks, painted murals, and beautifully carved wood furniture that beautifully reflect the landscape and culture of the region. All rooms and suites offer views over the lake and the Aravalli mountains in the distance. Besides the enchanting location and beautiful rooms, The Taj Lake Palace is where you can truly unwind and slip into the Indian way of life at the Jiva Spa. For foodies, the hotel boasts four restaurants serving Asian, Indian, contemporary western dishes. No matter what mood you’re in your personal butler will take care of your every whim, so whether you fancy dining by the lily pond or on your own private rooftop you’ll be able to create your own magical moments.